A sequel to the 2015 game by Mouldy Toof which was a unique arcade 2D platformer with elements of logic and RPG productions. 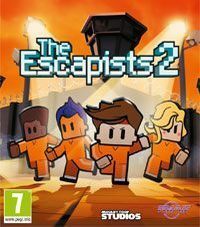 The Escapists 2 for PC, PS4 and etc. is a sequel to 2015’s The Escapists by Mouldy Toof. It was published by Team 17 Software, known mostly for the Worms series. The title doesn’t turn the original gameplay formula upside down. It is still a 2D arcade adventure game with elements of logic and RPG. The players assume the role of inmates locked up in heavily-guarded prisons. Our task is to break the system down and escape. Of course, it only sounds easy — while pretending to live our regular prison life, we have to collect items which we will turn into tools that we need to escape, search for allies among other inmates, and so on. Several improvements were made in comparison with the original game. We have new ways of spending spare time of which we have plenty in prison. The players can, for example, join a music band or learn to paint. Apart from that, the developers of The Escapists 2 for PC, PS4 and etc. introduced additional items that can be crafted from salvaged objects. There is no shortage of new ways of escaping, as well. Since prisons are now multistory, and we can get out of a higher floor by tying bedsheets together to go out of the window unnoticed. Furthermore, the combat system was altered — players can block incoming blows and perform strong or weak attacks. Everything is complemented by lesser enhancements, including more customization options for our character. The most important novelty in The Escapists 2 for PC, PS4 and etc. is the drop-in/drop-out multiplayer mode which the original game lacked. In the second part, a maximum of four players can play cooperatively or competitively, either on a split screen or over the Internet. The graphics of The Escapists 2 were slightly enhanced in comparison with the game’s predecessor. The production retains the same pixel art style, though.